I daydream a fair amount about what my future ‘forever’ house will look like, and share a lot of those dreams on my blog, but one thing I’ve not written about really is what sort of Kitchen I’d like. It’s odd, I used to look at peoples outfits and handbags on instagram and pinterest etc, now it’s interior shots that I swoon over! It’s funny how fast interior styles go in and out of fashion, three years ago I think my ‘dream’ kitchen might have looked a bit different to how it does now! Our kitchen is big but L shaped which is far from ideal. I’d love to have a lot more cupboard space and an american style double fridge freezer, plus a breakfast bar, range cooker and lots of light! Out of that lot our current kitchen only has the ‘lots of light’ option! The photo below is of my friend Donna’s kitchen, and it’s just gorgeous! I know it took a lot time to do as it was remodelled as part of her extension but I think it was worth it. 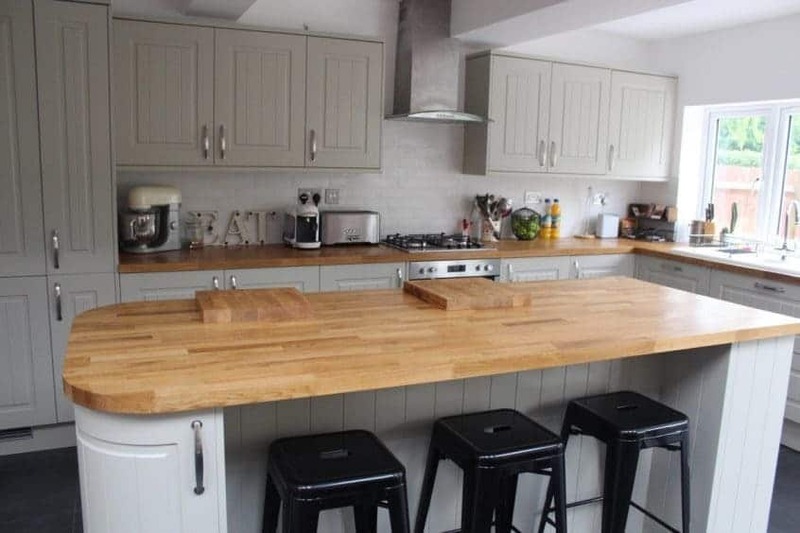 I love the style of her cupboard doors and her Oak worktops are just divine! She also has really funky draws in the kickboards underneath her lower cupboards – genius! I’d love a patterned tiled floor and a big range cooker for all the roasts and baking I’d obviously be doing on a regular basis! A double Belfast sink wouldn’t go amiss for soaking the roasting pans and the odd bit of washing up. Cupboards galore for storing all my pots, pans and cooking equipment in, because at the moment they are stacked up willy-nilly and there is almost an avalanche every time I open the door! Lots of nice clear wooden worktop space for displaying our ‘best china’ on, and a DAB radio would be given a home too, for company when cooking and background music when entertaining. A walk in larder would be an essential, so I can see everything at a glance and grab the ingredients I need when I need them because in this fantasy world my cupboards would be fully stocked at all times! In terms of colour I’d like a nice warm feeling kitchen, with terracotta and earthy tones, with lots of neutral toned appliances, I have a cream stand mixer already so we’re halfway there! This is a collaborative post. Thank you to Donna for letting me share her Kitchen photo!